Some people go to Disney land growing up (for the record, I did that, too). But some people also go see metal railroad bridges in the middle of nowhere. My parents strongly preferred the latter type of vacation. Hence, how I spent part of my summer when I was fourteen. It was spectacularly uncool — like nearly everything I did growing up. I wanted to hang out with my friends and read Harry Potter, not go see a railroad bridge. 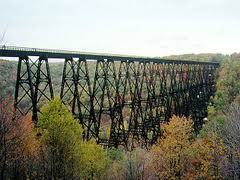 Specifically, we went to see the Kinzua Bridge in northern PA. Behold, turn of the century engineering — last century. But I didn’t crawl. But I did whine. I also took frequent pauses, and when I did, it was breath-taking. I remember stopping to watch a deer drink in the creek bed below. It’s one of those idealistic Appalachian valleys they put on post-cards. And the bridge? The bearer of the murder walkway suspended me in the middle of it all. That was nice, or as nice this bridge was going to be to me. I got the other side, and it was just like the side I’d left. And then, I had to inch my way back across — at least this time, knowing the boards should all hold my weight. My dad, of course, is striding across the railroad tracks, looping across the bridge in twice the time it took me to complete the round trip. I’m still glad a train didn’t come along. I would have pressed myself against the railing and cried. If that bridge had been shaking, the sunny day ordeal would’ve turned perilous. I wouldn’t have wanted to be there during a storm. 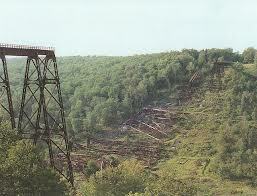 Years later, mom mentioned how she regretted not crossing the Kinzua bridge. You see, it blew down in a storm (I did tell you it was old and definitely a bit unsafe). She said she wished she would’ve done it. And that stuns me. It took a few hours! You let your teenager limp her way across it. What held you back — no, really, what was it? She couldn’t say. It wasn’t that she has a fear of heights. It’s not that the weather was bad. Maybe the thing was just imposing — somethings just are. There are things that are bigger than us that are (even objectively) a bit unsafe. There’s a risk in engaging those things; they’ve got a power of their own, an intrinsic ability to humble you. But to go out there, to risk several hours of questionable walkways, is worth something you didn’t even know existed. It’s a change jar for your nerves — slowly accumulating to a point where you realize you might be stronger than you suspected. And not crossing a bridge is a silly regret to have. Especially because you can’t go back. That chance is gone — the bridge is literally no longer there. Kinzua Bridge in 2013. It blew down in 2003.